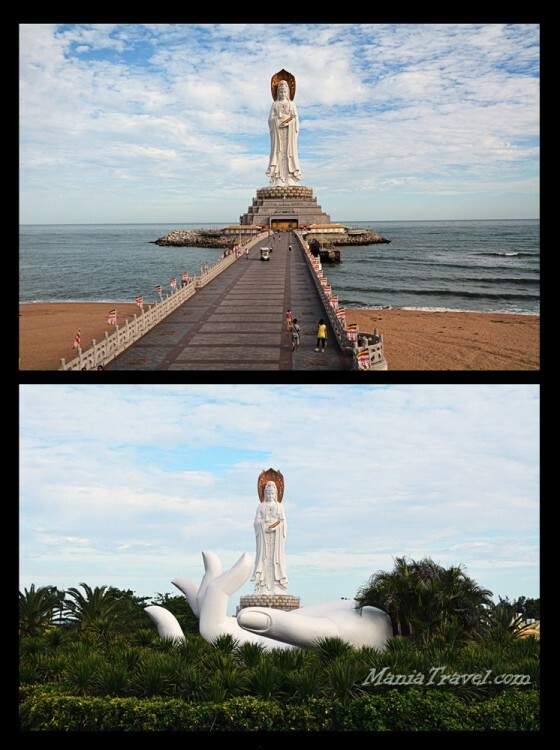 The Guanyin of Nanshan is a 108-metre (354 ft) statue of the bodhisattva Guanyin, sited on the south coast of China's island province Hainan near the Nanshan Temple of Sanya. The statue has three aspects: one side faces inland and the other two face the South China Sea, to represent blessing and protection by Guanyin of China and the whole world. One aspect depicts Guanyin cradling a sutra in the left hand and gesturing the Vitarka Mudra with the right; the second with her palms crossed, holding a string of prayer beads; and the third holding a lotus. This is currently the fourteenth tallest statue in the world (many of which are Buddhist statues) and the tallest statue of Guanyin in the world.